The minor drainage of Spencer Canyon, unnamed on topographic maps, joins the Escalante River 12 miles downstream of the UT 12 crossing; it starts at the base of a line of sandstone cliffs, winds across sandy ground then enters a medium width, sheer-sided, relatively shallow ravine. The land either side of the lower part of the wash is a slickrock plateau, split by several deep, straight cracks which intersect the main canyon at right angles, and the longest of these (one mile) forms a short but very dark and enclosed slot at the upper end. 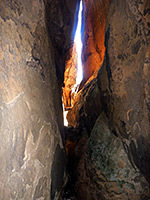 Exploring from plateau level requires ropes, to overcome a few dryfalls, but most of the slot can be seen by walking up from below, after entering the main canyon either by hiking down where the walls are sloping rather than vertical, or by descending a shorter tributary, parallel to the larger one. 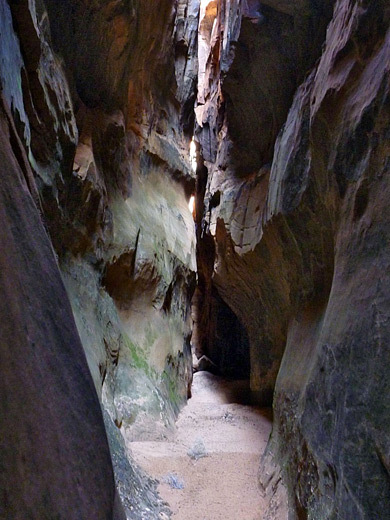 The sheer-walled ravine and its perpendicular tributaries are reminiscent of some canyons in Zion National Park, which have a similar layout, though here the relief is less and the canyons are usually dry, apart from several persistent pools in the sheltered upper reaches of the longest crack. The location is not much known, but the proximity to Escalante and the relatively easy access ensures a regular trickle of visitors. 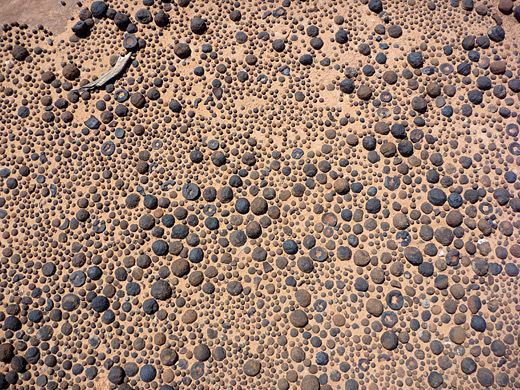 One other point of interest is the presence of innumerable small, perfectly circular sandstone balls ('moqui marbles'), strewn over the surrounding sandy flats and along the canyon floors; these are common all across the Escalante area but are especially plentiful here. Old Sheffield Road is used to reach Spencer Canyon; this good dirt track forks off UT 12 a little way down its spectacular descent into the Escalante River valley and heads east, close to a plateau rim, passing several popular places for primitive camping. The road descends to Little Spencer Flat after a mile, then, after a few more undulations, to the much wider spaces of Big Spencer Flat, becoming straight and level, across smooth earth. A junction is reached after 5.8 miles, where the main route turns due south while a minor road continues east. A BLM sign states this is for foot and horse traffic only, yet car and ATV tracks continue a way, at least as far as a turn around point a short distance further. The open, sandy surroundings are gradually replaced by bushes and patches of slickrock, as the track passes a second 'no vehicles' sign and starts to descend, the surface now very soft and sandy. A third such sign marks the edge of the North Escalante Canyons Wilderness Study Area, and by now there are no ATV tracks visible. The road ends at the edge of a larger expanse of slickrock, sloping gently down to a small, straight-sided valley sheltering a few ponderosa pine trees, which provides one possible entry into Spencer Canyon (route 1 on the topo map). Another (route 2) is down the cliffs at the junction of the next tributary northwards, but more interesting is to descend this adjacent drainage (route 3), as described below. 22 views of Spencer Canyon; gallery, slideshow. Topographic map of Spencer Canyon. 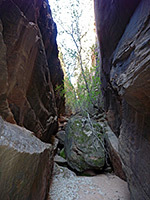 The smaller of the two west side tributaries of Spencer Canyon starts quite abruptly, with a sandy slope leading to a sheer-walled ravine. The upper end is blocked by a few bushes so an easier entry is along the south rim a way, descending into a darker section beyond most of the undergrowth. 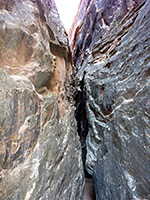 The canyon deepens rapidly, via boulder piles and chokestones, but sloping ledges on either side make it easy to climb down. The lower end is rather gloomy, entrapped between vertical walls of dark sandstone, though these soon open out as the drainage rounds a sandbank and meets the much wider main fork of the canyon. The longer tributary, with the best slot, joins from the west a short distance downstream, and is also straight at first, containing a few big boulders then, after a slight kink, becomes narrower, still straight, and is blocked by the first of several short but deepish pools. This may be bypassed by climbing around to the left, into a temporarily more open area that has a few more boulders. 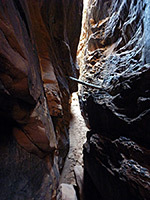 Two minor tributaries join at right angles, one at either side, immediately followed by a second pool, passed by climbing a bit higher up a sandstone fin on the right. Shortly after a third pool the canyon constricts again, forming a good, enclosed slot, soon obstructed by a thin pool with a long wedged at the far end. The pool can be waded, or passed by stemming above. Next is a darker part of the slot where the walls come together above and twist a few times, blocking all sight of the sky, so that the passages are dull, and rarely illuminated by the sun. Another thin pool of indiscernible depth preceds the first of several sheer drops from above, this being nearly at the far upper end of the drainage.